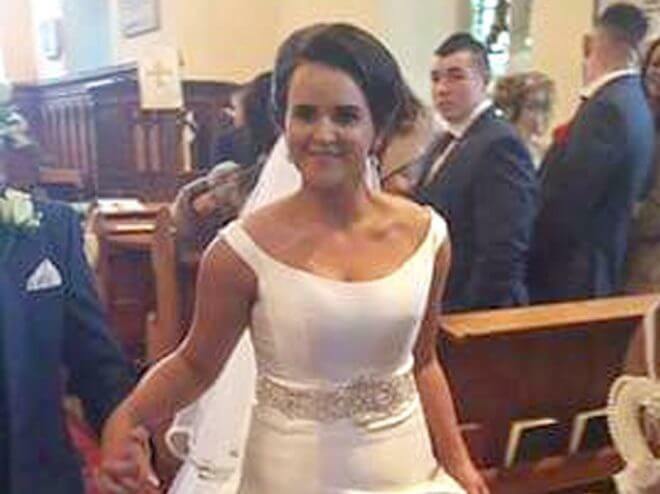 The funeral will take place this afternoon (Wednesday) of Amanda Kelly, a young newlywed and mother of one, who was killed after her car collided with a lorry near Clogher on Friday morning. Mrs Kelly (née Little) died after her BMW was involved in a crash with the articulated lorry on the Ballagh Road between Fivemiletown and Clogher shortly after 6am. The male lorry driver was physically unhurt. The 25-year-old from Corick Road in Augher, was on her way to work at Scott’s Bakery in Fivemiletown at the time. Her father Andrew and sister Nicole also work at the bakery. She had only married agricultural contractor Emmett Kelly last New Year’s Eve and the couple have a two year old son, Jack. Amanda’s mother, Wendy (née McCusker), posted a picture on Facebook of her precious daughter walking down the aisle on her wedding day with the words: “Our beautiful girl, now in the arms of God.” She is also survived by her brothers Aaron, James and Alex, mother-in-law Siobhan, brother-in-law Dominic and sisters-in-law Grace and Davina. In a further tribute, hundreds of people stood in silence in Fivemiletown on Saturday evening as a lone pipe played a lament for the popular local woman during Cavanaleck Pipe Band’s annual parade. A former pupil of Fivemiletown College, Amanda’s funeral will be held later this morning at St John’s Parish Church in Fivemiletown at 1pm with interment afterwards in the adjoining Churchyard. Speaking to the Herald, Rev Canon Kyle Hanlon said it was a tragedy which had shocked the entire community. “It is absolutely devastating to lose a young person with her life ahead of her. It is clear from her many friends and relatives that she was a beautiful person. She was someone who was very generous, someone who had shown so much love, kindness and compassion during her life. UUP Cllr Victor Warrington said her death was a desperately sad loss of a young life. Police have urged witnesses to the collision or anyone who was travelling on the Ballagh Road on Friday morning and may be able to assist the investigation to contact them on 101. A women in her twenties has died after her car collided with a lorry in Clogher, Co Tyrone. The crash happened shortly after 6am today when the women’s BMW collided with a articulated lorry on the Ballagh Road. The male driver of the lorry was left unhurt. Police have said the road will be closed for much of today as they investigate. A woman in her 20s has died following a collision with a lorry this morning. The woman was the driver of a BMW car that collided with an articulated lorry on Ballagh Road, Clogher, Co Tyrone shortly after 6am this morning.